Aberdeen manager Derek McInnes praised the contributions of Scott Vernon and Jamie Langfield following the 3-1 Premiership win over Dundee United. Vernon's hat-trick and Langfield's saves were the difference as the Dons tightened their grip on second place. And McInnes said: "Vernon takes his hat-trick brilliantly. "They got into some dangerous positions, but Jamie was there and, again, just as he has been this season, he has been excellent." A tidy finish by Vernon was cancelled out by Sean Dillon's deflected shot. 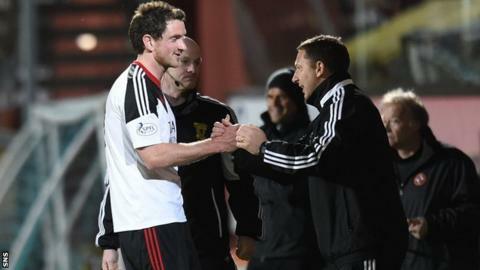 However, Vernon headed Aberdeen back in front before rounding off his treble by rounding goalkeeper Marc McCallum. "I thought we played very well in the opening period and deservedly went in front," reflected McInnes. "Scott Vernon took his opportunity really well. I thought we started with real impetus - as you need to do against Dundee United. "I just thought we lost our way a wee bit and half-time came at the right time for us, because we lost a poor goal. "We should deal better before Dillon gets the opportunity but the response in the second half from the players just epitomises everything we've been this season. "We dealt with a lot of their long balls and I'm really surprised at the back-to-front stuff we had to deal with but we stood up to it well. "I've been really pleased with what we've been getting from the majority of the starting team. When injuries come, it's up to others to come in and take that responsibility and nobody took it more than Scott, absolutely delighted for him." Aberdeen were already assured a Europa League qualifying place before the match at Tannadice and McInnes was pleased his players did not let-up as they try to secure the runners-up place. They now lead Motherwell by four points ahead of the latter's match against Inverness on Wednesday evening. And the Dons host the Steelmen on Sunday, the final day of the league season. "I think that's us beaten our best points tally for over 20 years and we've still got a lot to play for come Sunday," added McInnes. "We've got a game now that we probably have to go and win but it's a game that we look forward to. What an opportunity to finish second, with a home game. "As difficult as Motherwell will be, because Motherwell have been excellent this season as well, we're going to have to play well, as we did do for the majority of the game tonight, to give ourselves a chance to win that."